We shouldn't be surprised by the direction our executive branch has taken: some of the top civilians involved in this war signed this statement of principles. Cheney, Rumsfeld, and Wolfowitz are all there. I don't think there's any doubt that the U.S. will eventually win the war in terms of (choose one: conquering, liberating, destroying, changing-the-regime-of) Iraq. I wonder, though, if the cost will make it seem like a win. The principles from the link above would seem to indicate that relations with other countries will be determined by might instead of diplomacy; The undersigned probably don't care if we burn every diplomatic bridge we encounter. The Agonist has up-to-the-minute information about the ongoing war. As opposed to most of the other war-info weblogs (warblogs: how I hate that term) I've seen, it seems largely unbiased and fair. A long-overdue Postcard Update! They all seem long-overdue, don't they? I thought of a new game while in Peru. A variation on "Where's Waldo?". Totem Spotting. Travel the world, go to exotic places and get a picture taken with the Totem or Monkey shirt. 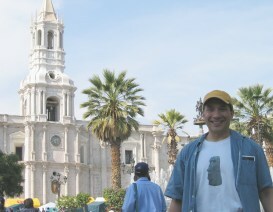 Here is the first in the series -- taken in Arequipa, Peru. That last post required my to finally figure out where that "Do you like Abba?" (in Father Gudio Sarducci's voice) quote comes from. Believe it or not it comes from a 1985 Judge Reinhold/Eddie Albert movie: Head Office. "My tape! My Julio Iglesias tape! "Only a year ago, [Britain] and the United States were part of a coalition against terrorism that was wider and more diverse than I would ever have imagined possible. History will be astonished at the diplomatic miscalculations that led so quickly to the disintegration of that powerful coalition." "I have heard it said that Iraq has had not months but 12 years in which to complete disarmament, and that our patience is exhausted. Yet it is more than 30 years since resolution 242 called on Israel to withdraw from the occupied territories. We do not express the same impatience with the persistent refusal of Israel to comply." "What has come to trouble me most over past weeks is the suspicion that if the hanging chads in Florida had gone the other way and Al Gore had been elected, we would not now be about to commit British troops." Yup, that's me over there being obviously overjoyed to be modelling my stylish new glasses. Since September, I noticed that my eyes were getting tired very quickly. When I started my new job, they would be noticeably tired by noon or so. Yeah, I'm spending a lot of time in front of the monitor, but not more than when I was at Broadcom. (And, yes, I know all the various ways to keep your eyes from getting tired and going bad when at a computer. None of it worked a whole lot.) So, I finally went to an optometrist to have them checked out. He (and his various machines) declared that I was slightly farsighted and probably had been since I was born. (I guess a lot of people who have "normal"/non-corrected vision are.) So, he prescribed glasses for using the computer and reading and other close things. In other news, my glaucoma test showed slightly high pressure in my eyes. It's in the "gray area" according to the doctor; I make a repeat visit in 3 months to have it checked again. The doctor said my eyes were not filling up like a water baloon and would not explode. This is something of a relief. Anyway, my glasses are very weak as far as I can tell (+50,+50, whatever that means). They do make things that are far away blurry. Hopefully they will reduce my eyestrain.